Joyce Carol Oates makes her first appearance (I believe!) 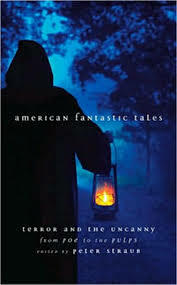 in the monumental Library of America this Fall when the two-volume American Fantastic Tales: Terror and the Uncanny, edited by Peter Straub, is published. Joyce Carol Oates, when inspired, is immediate in her response to requests for stories. I commissioned a short-short from her for Omni and a couple of weeks later I received it, as well as “Family,” which is certainly science fiction, definitely horrific, and has all the earmarks of an Oates gem. The basic plot is simple: An isolated family adapts to changing times. It’s only when one considers the nature of the changing outside world, and the bizarre nature of the family’s adaptations, that “Family” achieves its full effect. JCO’s second contribution to the Library of America will be a volume on Shirley Jackson that she is editing. EDGAR ALLAN POE. BERENICE (1835).